We are proud to offer the U.S. Department of Agriculture (USDA) rural housing service product. Utilize this program to help low-to-moderate income families achieve homeownership in your eligible communities. To determine property eligibility and income limits visit http://eligibility.sc.egov.usda.gov. ^LTV may exceed 100% only by the amount of the Guarantee Fee financed. Value to be based off of original loan balance. 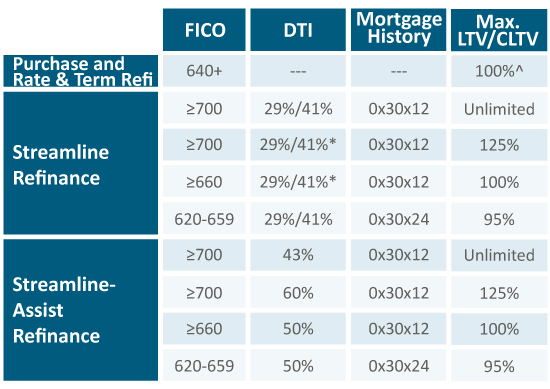 If the loan we are refinancing was originated before 1/1/2009 and is in AZ, CA, FL, NV, or MI, a 2055E or 1004 will be required; these loans will be limited to a maximum LTV/CLTV or 125%.